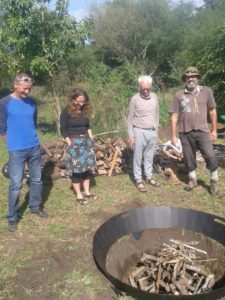 After months of preparation, the first trial of an open-sourced biochar kiln ring went ahead on Sunday the 8th April at the Quaker Settlement in Whanganui. Shane Middlemiss a new resident to the settlement was inspired to do internet research to improve the soil quality of the Settlement’s sandy soils. His research suggested that sandy soils could be helped by the addition of ground charcoal a.k.a. 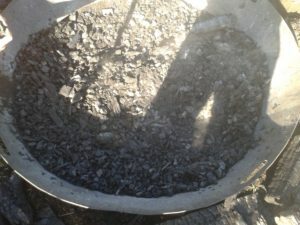 biochar. Further research showed a recent Swiss open kiln design that mirrored ancient charcoal pits. A version from Nepal was even cheaper with a steel ring that has a steep-sided pit under it. He experimented with free CAD software to lay it out and a local engineering shop laser cut the pieces. The project was funded by anonymous Settlement donors. With his friend Aaron Tasker, Shane bent the steel into quarter rounds, welded them together and after a coat of chimney paint it was done. The Management Meeting at the Settlement supported the trial and the use of scrap wood from the Settlement and soon 3 cubic metres of wood was found from over or undersized firewood and fallen branches. A fire permit was secured, a burn site was found, the kiln was assembled and it was ready to burn. Supported by the nod of the resident keruru the fire pit was dug. Interested friends arrived and the fire was started. A big magnifying glass worked a treat to start it without matches or paper. A bottom layer burned to a coating of ash and then the next layer went on and so on. 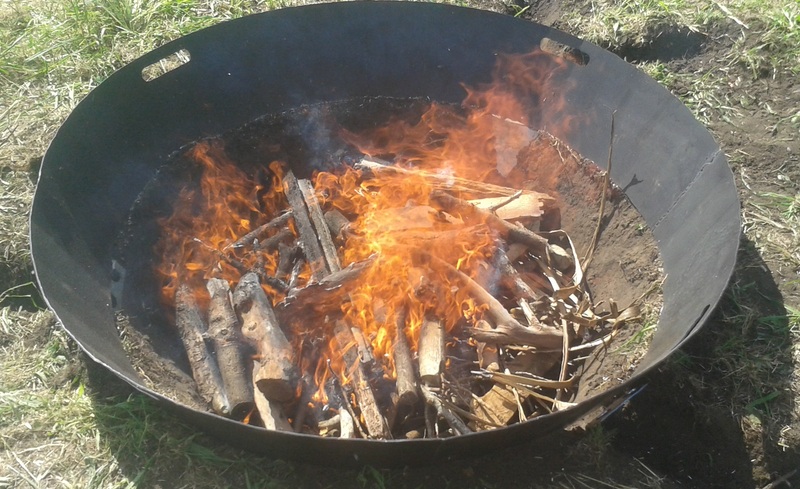 The fire acted to heat the wood below while keeping oxygen away from it which are the conditions for making charcoal. It wasn’t quite the smokeless fire promised by the inventors but nearly and with better fire-keeping it could be. After three hours the charcoal had neared the top of the pit and ring and the time was right for quenching. Five big buckets of water went down the sandy sides with a hiss but had no real effect on putting it out. The hose eventually worked in dousing the fire and for hot spots. A lot of shiny black charcoal was filling the pit. Success!! 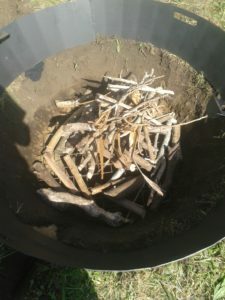 Some unburned bits of wood, especially cabbage tree were extracted. Charcoal is formed. It is a beautiful shiny black which doesn’t show in this light. The charcoal filled a twenty litre bucket seventeen times so we made 340 litres in total. 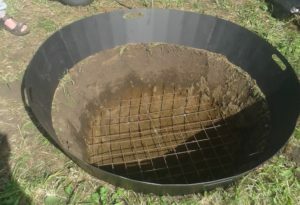 Once crushed, fermented with nutrients and put around vegetable plants and fruit trees this biochar will grow a lot more quality food and save more than 600kgs of carbon dioxide from the atmosphere or the equivalent emissions from driving 2,600 kilometres in an average passenger car. This charcoal will be crushed and upwards of thirteen elements including Vermicast, compost, fish fertiliser, beneficial microbes, nutrient dense fertiliser and many other things will be added. This will marinate for two or more weeks and then be added to the soil. We will show the results over the following months. This trial to make biochar has been a resounding success.